VRHabilis was selected to perform an Underwater Remedial Investigation/Feasibility Study (RI/FS) at the former Camp Gordon Johnston (CGJ) located in Franklin County, Florida. VRH divers are certified by the US Navy, or their equivalent, to dive SCUBA and “surface supplied” equipment. The VRH divers can dive any time of the year and are also certified in the safe handling of UXO. VRHabilis is well trained in the most advanced methods to detect and locate magnetic and conductive irregularities in the most challenging marine environments. Whether diving from our Mobile shore based dive modules, or operating from on of our dive boats miles from shore. VRH brings an innovative approach to solving problems in underwater UXO. 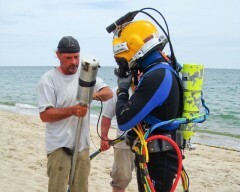 VRH performed shore based underwater remedial investigation using analog grids to identify and measure munitions and “munitions of explosive concern” (MEC). VRH used our proprietary HeckHousing underwater housing for the Schonstedt ordnance locator. VRHabilis worked closely with the project geophysicist to plan the layout of the grids to gain the most data with the least exposure to the divers and the public. The VRH dive teams worked closely with the geophysical mapping team to collect data over a large offshore area. The divers returned to the selected irregularity locations to study and identify the irregularities. The VRH team covered a vast offshore area in a short period of time, satisfying the project requirements to describe and define the limits of ordnance contamination. VRHabilis dive teams safely performed the destruction and/or appropriate management of MEC, MPPEH, and MD, with a perfect record of regulatory compliance.